You’ve got a Tempranillo ready to imbibe, and now you need a good meal to go along with it. What to do? 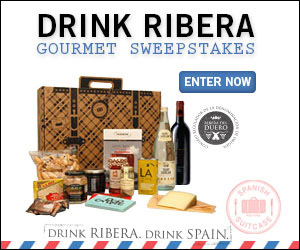 Enter the “Drink Ribera Gourmet Sweepstakes” for a chance to win one of our travel-inspired, coveted gourmet gift baskets from Spain. 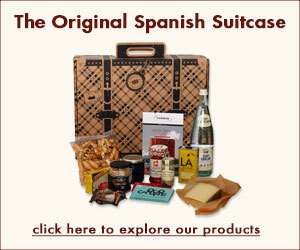 Now through Tues, May 14th at 2:00 PM EST, we will be giving away four Spanish Suitcase gourmet gift assortments as part of a sweepstakes hosted by Drink Ribera, one each week. Winners will receive a deluxe Spanish Suitcase curated for Drink Ribera to showcase top gourmet exports from Castilla y Leon and the surrounding regions of Ribera del Duero, including Inés Rosales Olive Oil Tortas from Seville, Dequmana olives from Losada, Conservas Artesanas María Jesús Piquillo Peppers from Navarra, Chocolate Orgániko chocolates from Madrid and more. Each assortment is packaged in a custom-designed, eco-friendly “suitcase,” which comes with a letterpressed “passport” describing the gourmet contents of the collection. Not familiar with Ribera del Duero? Also known as “Tinto Fino,” the region is located in the North of Spain along the Duero river. One of Spain’s eleven recognized wine regions, Ribera is well known for its high altitude vineyards, flat terrain and extreme climate, which help produce elegant and food-friendly wines, like those made from Spain’s most famous red variety, Tempranillo. Now through mid-May, keep checking back here for exclusive content supporting the “Drink Ribera Gourmet Sweepstakes,” including winner announcements, insights on Ribera wines from Kerin Auth at NYC’s premier Spanish wine shop Tinto Fino and recipes and travel ideas inspired by the Ribera region.